This Children’s Mental Health Week, Place2Be have been encouraging young people to celebrate their uniqueness. 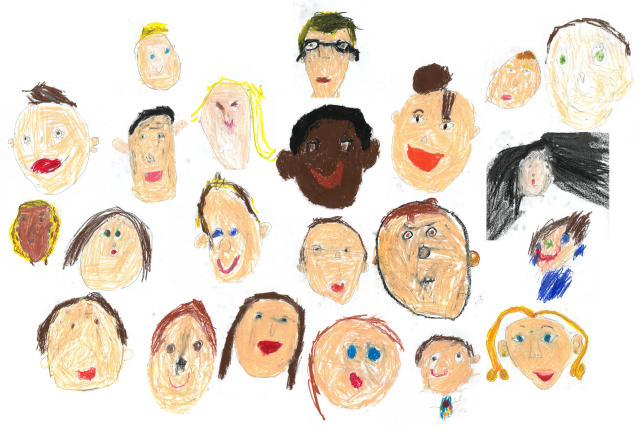 To mark the week, we invited the children of Fairwater Primary School to show us what #BeingOurselves means to them by creating a self-portrait – whether it’s giving a big smile, wearing their favourite bow or putting on their best or silliest hat. Yesterday we received the finished artwork, and we’re thrilled to see the diverse range of happy, smiley positive children! Throughout the week the pupils have been discussing the importance of inclusion and positivity in the classroom. Pupils have been writing compliments to each other and giving praise for others achievements. We have loved it! A huge thank you from us to the children and teachers at Fairwater Primary School for helping us mark this week. We will be using the fantastic portraits to create a collage, which will feature on our new NCMH bags to be given out at our events throughout Wales over the coming months. One in ten children aged between 5 and 16 years old has a mental health problem. That’s three in every classroom across the country. We also know that over half of all mental health problems start before the age of 14, and 75% by the age of 18. These problems can have a big impact on children affected, as well as their families, and can often continue into adulthood. We want to highlight these issues and lend our voice to the calls for early intervention for children who experience these problems. We also believe that schools should be given the support and resources to promote positive mental wellbeing from an early age.